Before your portrait photoshoot, we meet to discuss the style and look of portraits that you are really interested in. One of those styles is a fashion photography style. Of course, you may wish to have lots of different kinds of portraits with lots of different styles. One way that you can get ideas is to look through the images on this website, and also look through Pinterest to see the kinds of looks you like. We will not be able to get every image exactly the same, but it does give us some ideas to look at. We can see what you like from the images you have chosen. Maybe it is the lighting, or perhaps the posing of the person in the portrait. It could even be the colours and tones that you really like and resonate with who you are. Once I know the style you like we can start working on a plan to achieve just that. Every photo shoot really is bespoke to the client I am working with. 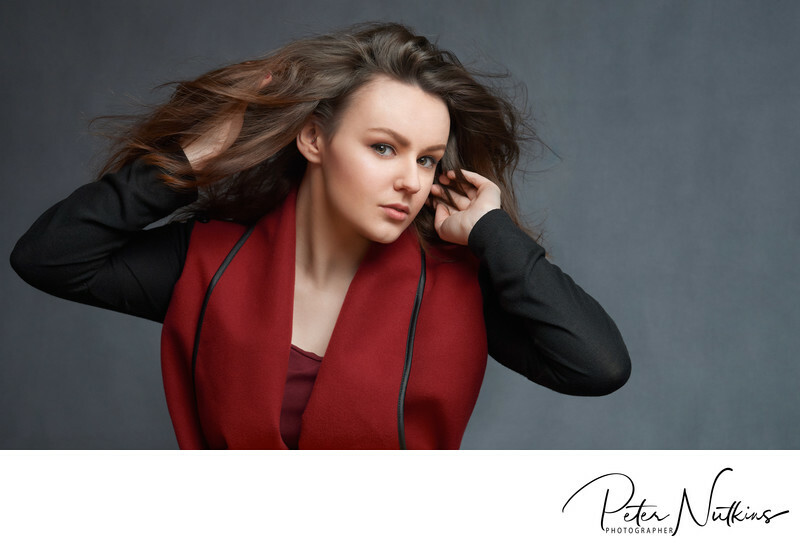 This portrait photograph is of a young lady who was interested in a fashion pose. At this point we had spent some time working on which aspects of her face she really liked. As you can see, she is blessed with a lovely jawline and long neck - both are fantastic for fashion style photography. We had already worked on a number of portraits and this was one of the last photographs I took. You can really see the confidence and eye contact that had grown in leaps and bounds from the start of our time together. She had moved past seeing that she was beautiful and now felt beautiful. It did not take long before she was in the groove and she got lots of wonderful poses just like this one. To add a little more drama we had a little breeze blowing through her hair. This really livens the portrait up and gives a really dynamic feel to the final image. In your portrait photoshoot I will teach you some simple steps to get a great look. It is more about the idea or principle of how to stand or move rather than any particular positions. Working like this means that in the future you will get great results from any photograph taken of you anywhere by following my simple guidelines. Like all of the portraits on this website, this photograph was taken in a real home.